The beginnings of the Creekside Estate Winery were in 1997 and from then, the winery has grown to be a very successful winery in the region earning laurels from both peers and industry experts. 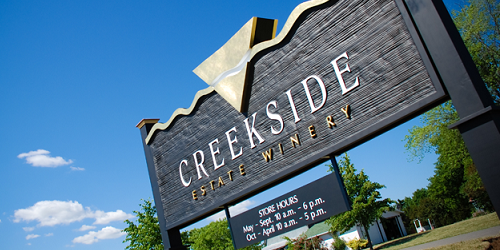 The Creekside Winery, located in Jordan, Ontario has been awarded several nominations for Canadian Winery of the Year and nominated for the Winemaker of the Year in Ontario in 2008. Laura McCain holds stewardship over the winery which is currently managed by like-minded industry experts. As a pioneering winery, Creekside aims to make unquestionably unique wines which represent the Niagara Peninsula's distinctive micro-climates and push tradition. The trademark of Creekside wines always bear the mark of quality, class and distinction that go further into five main types - Estate Reds, Reserve Reds, Undercurrent, Icewines and Reserve Whites.